Yesterday, 28 November 2014, Venezuela’s male Under-20 side were awarded the silver medal at the XXII Central American and Caribbean Games, finishing runners-up to host nation Mexico, who ran out comfortable 4-1 winners in the final. This result came in contrast to La Vinotinto‘s form on their route to the final as they progressed having topped their group following a 4-0 victory over Haiti, a 1-0 win over Costa Rica and then a goalless draw against Cuba. Subsequently, they met Honduras in the semi-final and defeated them 1-0 thanks to an early penalty from Zamora’s Jhon Murillo. 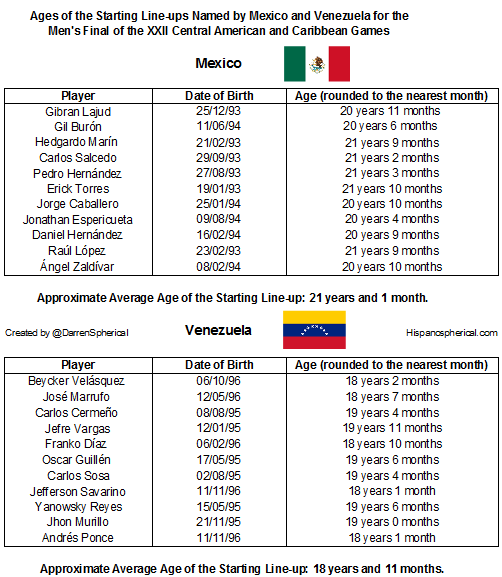 However, for a variety of reasons, Venezuela’s youngsters should not feel too downhearted about the final and one aspect that shall be given some brief attention here is the age-difference between the starting line-ups for the game. Indeed, not only were their opposition officially the Mexican Under-21 team but also there was, on average, a gap of over two years between the two sides – a difference that, in many international competitions, would see the teams separated and placed in different age categories. Quite notable is the fact that the oldest Venezuelan player to start, Caracas defender Jefre Vargas (born 12/01/95), is younger than the youngest Mexican named in the opposition line-up, the player of the tournament, Jonathan ‘Jorge’ Espericueta (born 09/08/94). Furthermore, the very oldest player in El Tri‘s line-up was Erick Torres (born 19/01/93), a man who has a strike-rate of 1 goal in every 2 games for MLS side Chivas USA – where he has been on loan for nearly a year-and-a-half from the more prestigious Mexican side – and who also scored the winner for the full national team against Panama in October. He is over three years and nine months older than the two joint-youngest players who began the game for La Vinotinto: Zulia’s Jefferson Savarino and Llaneros de Guanare’s Andrés Ponce (both sharing a date of birth of 11/11/96), the latter of whom put in some impressive performances and was his side’s top-scorer with four goals. Plenty more insights can be gleaned from the information provided in the table below, but surely the most signficant conclusion to make is that the progress of this youthful Venezuelan side to the final offers much optimism for the future. Please note that all ages of the players have been rounded to the nearest month, depending on their date of birth in relation to the game played on 28/11/14. Thus, if a player has lived more than 15 days into a new month, their age has been rounded up. For example, José Marrufo, having been born on 12/05/96 was 18 years, 6 months and 16 days old on the day of the match and so has had his age rounded up to 18 years and 7 months. If anyone wishes to create a more precise comparison feel free, though one suspects that the average age-difference between the two sides would not change by more than a month or so, thus re-affirming that there was a gap of approximately two years between the two teams. This entry was posted in South American Youth Football and tagged Andrés Ponce, Central American & Caribbean Games, Chivas, Costa Rica, Cuba, El Tri, Erick Torres, Haiti, Honduras, Jefferson Savarino, Jefre Vargas, Jhon Murillo, Jonathan Espericueta, Juegos Centroamericanos y del Caribe, La Vinotinto, Medalla de Plata, Mexico, Silver Medal, Sub-20, Sub20, Under 21, Venezuela, Veracruz 2014, Vinotinto, Youth Football on November 29, 2014 by hispanospherical.